Teaching new words is one of the most important part of language learning. Sometimes students find it difficult to memorize large numbers of new vocabulary. So how should we approach teaching new lexis? 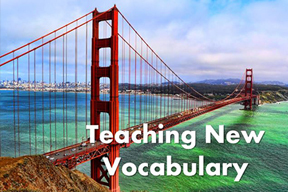 When presenting new vocabulary it is important to know how to introduce it to students so that it is easy to understand and remember the meaning. We should also consider the best ways to practice, memorise and recycle new vocab effectively. And finally, how to help students to be able to use new vocab in their speech fluently, easily and confidently. Below are some tips and ideas that should help you! First introduce the meaning* of the word. Check that all the students understand it by asking Concept Checking Questions (for example, ask: Are dinosaurs tiny? to check is student understand the meaning of tiny). Then drill the pronunciation of the word. Only after that, should you write the word on the board. Remember to identify the part of speech and mark the stress (if it is a problem for the students) or pronunciation peculiarities if there are any. c) To make the lesson less teacher-centred and to diagnose our student’s knowledge as well as promote peer teaching we can use the Test-Teach-Test approach (TTT). Here you need to create the need for the language, students understand what language they need to use if they don’t know it they’ll ask their peers and later the teacher. In such way, the language becomes more memorable. When doing controlled practice exercises make sure your students write in their notebooks not in the course book so that it stays clean and can be used later again. Try to make the most of the controlled practice exercise before moving on to the new task. For example, set pair work memory activities. At the fluency stage, encourage students to make true sentences about themselves. Personalisation is key to developing students’ fluency. Remember to provide model sentences so that students will know how to build correct sentences. Divide your students into two groups. One volunteer from each group sits on a chair with their backs to the board, facing their group. The teacher writes a word on the board so that the volunteer can't see the word. Their group must give explanations/synonyms/antonyms to their volunteer so that their volunteer guesses the word first. The first one to guess the word gets a point for their team. Then the next member of the team sits on the chair. And so on. Works great for all levels. You can practice any vocabulary. Divide the class into two groups. In turns team members come to the front of the class and mime the words/phrase that the teachers gives them on a slip of paper. The team that first guesses the word/phrase that is being mimed wins a point. Write the words which you want to recycle on small slips of paper. Put them in a file. At the beginning of the lesson students in turns take one slip of paper from the file and the task is to make a logical and grammatically correct sentence with the word. If the class is satisfied with the sentences then the students can keep the card. If not, the another student has to take the same card and make a new sentences. If it’s correct he/she keeps it. The student with the most cards at the end of the activity is the winner.